What is a Piedmont? By definition, the lower lying lands along or near the foot of the mountain range. 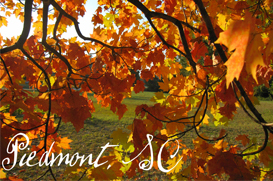 In general, the Upstate of South Carolina is known as the Piedmont. But there is a town, south of Greenville proper, with the same name. Around 1850 this town was established on the Big Shoals of the Saluda river, used by generations as a bridge, is known for the first large scale cotton mill in the state. Today Piedmont is located in both Greenville and Anderson counties which makes it ideal for homeowners who travel between Greenville and Anderson or even over to Clemson University and Atlanta Georgia. A wide variety of homes from starters to historic, fill the plateau of Piedmont. Located only minutes from Simpsonville and downtown Greenville, Piedmont offers residents homes off the beaten path, yet with more level topography than Greenville’s northern towns, and the convenience and affordability for deals in housing. This area is home to growing manufacturing suppliers to BMW and Michelin and continues to attract business to the area due to its inexpensive land and tax ratios. Its’ many golf courses, and parks are filled with outdoor activities all year round. This makes Piedmont a great place to consider as your home.